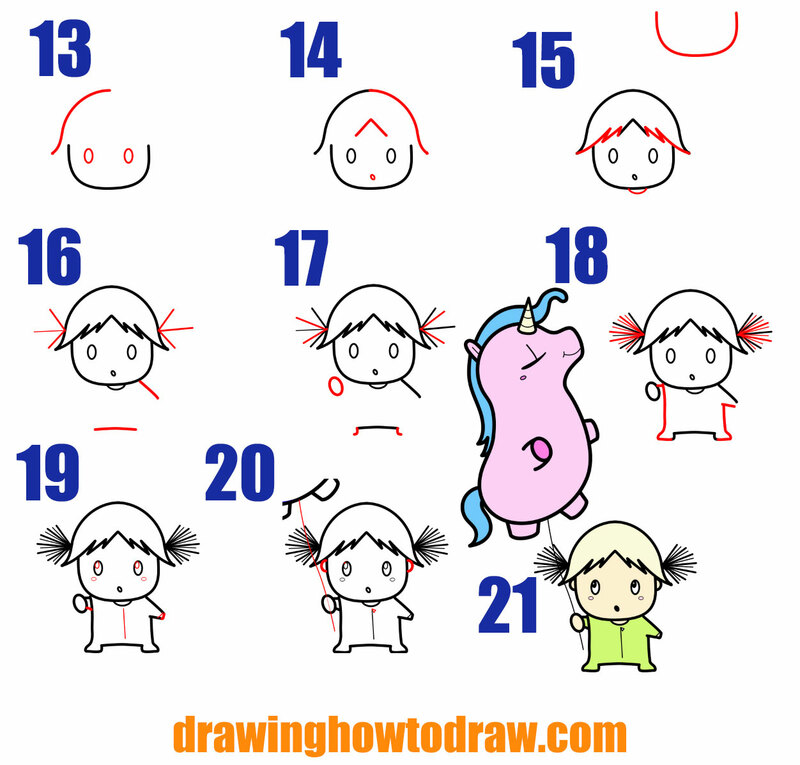 Today I’ll show you how to draw an adorable cartoon baby girl (kawaii) holding a balloon unicorn. 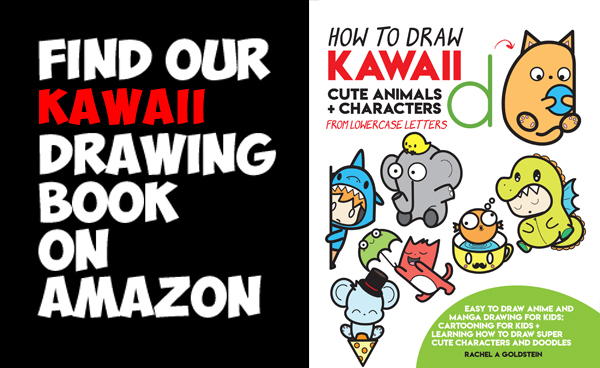 It is super cute and pretty easy to draw. We will guide you with simple geometric shapes, alphabet letters, and numbers. Follow along below. (Step 1) The blue lines in this tutorial are guide lines and are to be drawn super lightly as they will be erased later on. Lightly draw 2 ovals as guide lines. (Step 2) Outline the guide ovals as I have. (Step 3) Draw a “U” shaped ear. Draw a boxy backwards letter “C” shape for the snout. (Step 4) Draw some curved lines. (Step 5) Draw a curved line on the eye lid. Draw a letter “V” shaped horn. (Step 6) Draw some curved lines. Draw an “S” shape on the forehead. (Step 7) Draw 2 “S”-like shapes….meaning a curve forward and a curve backwards. (Step 8) Draw some curved lines. Draw a “Z” shape. (Step 9) Draw ovals. Draw an “S”-like shaped tail. (Step 10) Draw an “S”-shape on the tail. Draw curve lines. (Step 11) Draw some lines on the legs. (Step 13) Lets start drawing the girl’s head. Draw it below and to the right of the unicorn. Draw half of an oval for the face. Draw an “S”-like shape for the left side of her hair. Draw ovals for eyes. (Step 14) Draw another “S”-like shape for the right side of her hair. Draw an upside down “V” shape for bangs. Draw an oval mouth. (Step 15) Draw an “M”-like shape on either side of “V” for bangs. Draw a curved line for collar. (Step 16) Draw an arrow shape for each of her pony tails. Draw lines for body. (Step 17) Draw sideways “V” on each of her ponytails. Draw an oval and 2 “J” shapes. (Step 18) Draw more lines in ponytails. Draw a boxy #2 and #5 for her body. (Step 19) Draw ovals and lines. (Step 20) Draw a “C” shape for each of her hairs. Draw a curvy line for the balloon string. (Step 21) Color them both in.